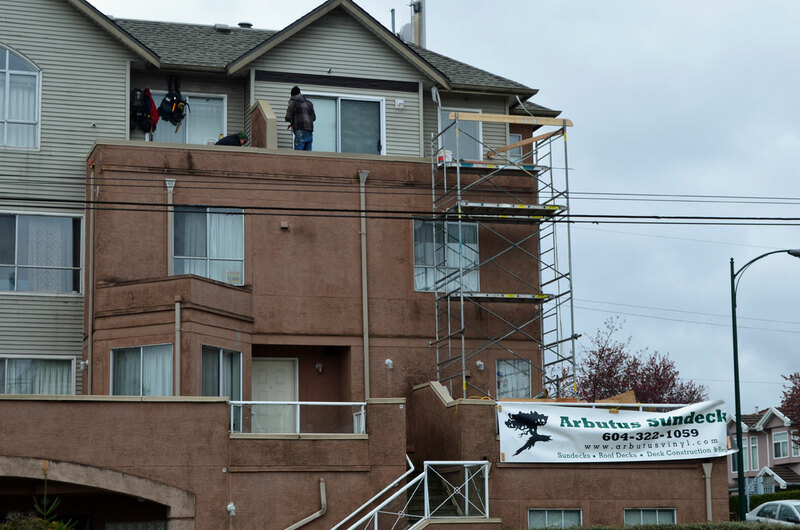 This building has over 24 roof decks that are in various need of repair. The vinyl decking is one source of water ingress that the decks are experiencing. 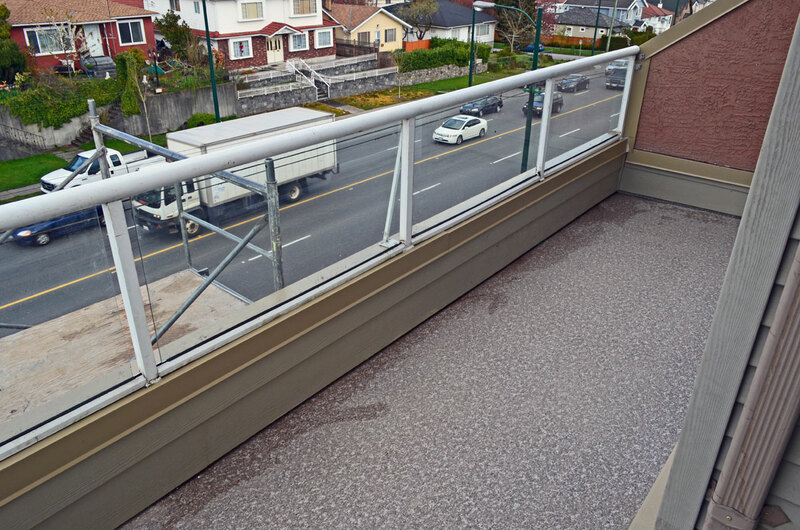 Another main failure that the balconies are having is that the cap flashing was not done properly from the initial new construction. 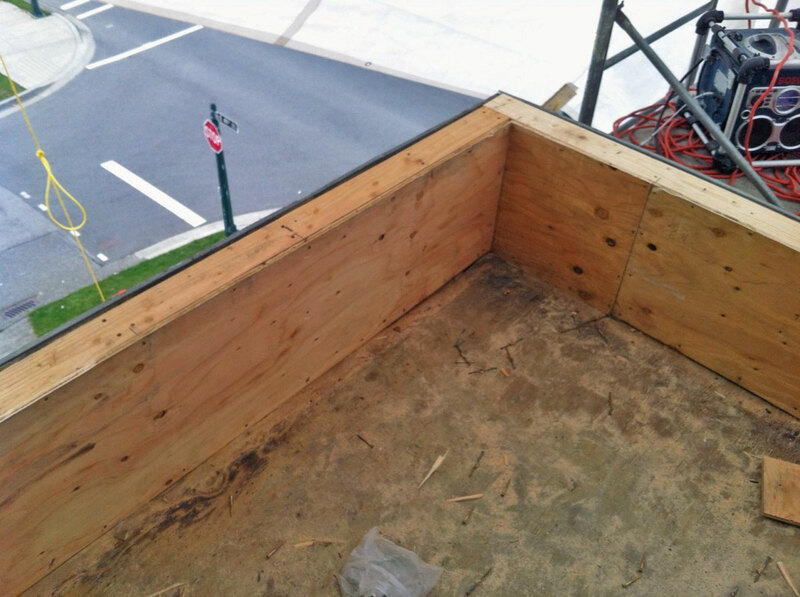 The original builder failed to install a self adhesive membrane under the metal flashing, so when water was able to get under the metal flashing it entered the wood framing. 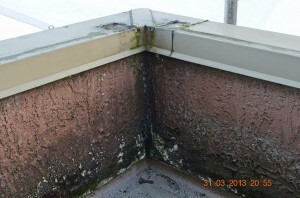 This caused a significant amount of rot in the parapet walls. You can see the walls around the balcony have mould and rot that is coming through the stucco. This deck repair would have been around a thousand dollars cheaper if the original builder had installed a self adhesive membrane under the cap flashing. Now we have to remove the existing cap flashing, remove the stucco around the deck, repair the rotten framing, and put it all back together. 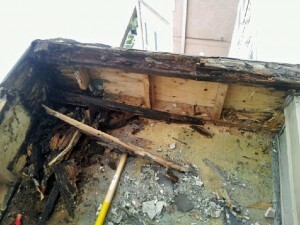 The majority of the damage was caused by this improper detail, as you can see the rot is quite extensive. It’s important to take note that the wall you see is acting as a guard wall with the railings sitting on top. If this structure fails it could very well mean that someone will fall off this deck and fall over thirty feet down. After all of the rot has been removed, and surrounding wood framing treated with a Boracol Solution (anti-fungicide and insecticide). We now can start on the deck repair. First the framing was rebuilt, then the vinyl decking is installed. 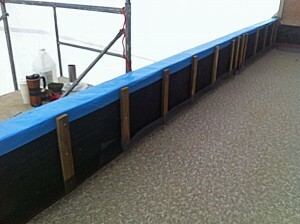 After the decking the walls were rain screened, the top of the wall has a self adhesive membrane put on (that’s the blue waterproof material you see on top of the wall). Then we used a siding product called hardi-board and a prefinished galvanized metal cap flashing. Here is the real guts of a proper waterproof wall assembly, everything after this sheds water but is not to be considered waterproof. 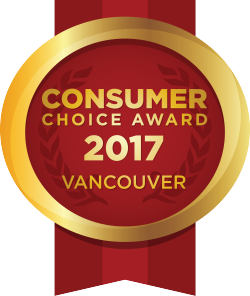 The siding and cap flashing are for appearance, UV protection and basically act as deflection barriers from the main waterproof parts.